We often turn to readily prepared fish fillets for reasons of convenience, time, or intimidation, but every cook can learn how to effortlessly fillet a whole fish at home! This handy skill will give you full control over the results (no more surprising bones mid-bite), and it’s definitely worth going the extra mile, as you will be able to check the freshness of the fish as a whole. 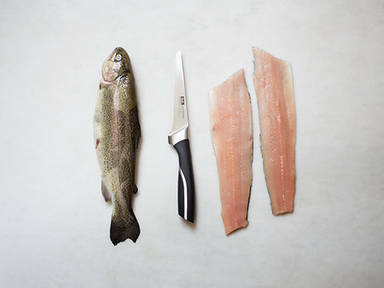 Look for firm flesh, clear eyes, and pink gills, and then start filleting at home! Plus, you can use the trimmings to cook aromatic fish stock.